Anybody even remotely associated with Indian culture has listened to and probably chanted the Gayatri mantra, an amalgamation of sacred Sanskrit syllables that expresses one's veneration of Paramatma. Many sources identify Her to be the prakriti roopa of Gayatra (Savitra), a solar deity described in the Vedas. The Devi Gayatri is the parlokiya (otherworldly) personification of this all-important mantra, wife of the majestic Sadashiva, and a roopa of Parvati. 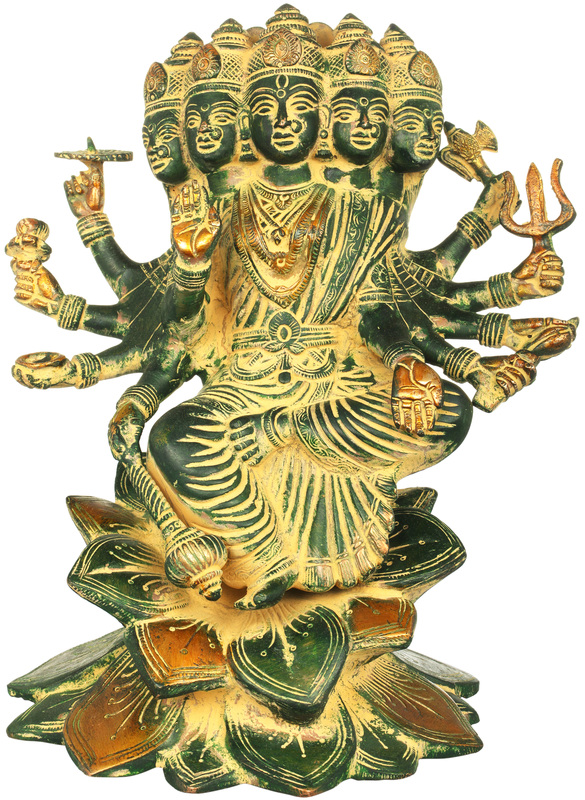 Like Her husband, She is panchamukhi (five-headed) and dashabhujadhari (ten-armed), the most powerful form of the Hindu Devi that there is. In each of Her hands are dharmic implements such as the begging bowl, the dharmachakra, and divine weapons to defeat adharm; while the anterior pair of hands are poised in blessing. The sculptural depiction of the Devi is flawless in terms of the beauty and power expressed. Her gaze is straight; Her composure of Her full-featured countenance, determined. The folds of Her silken saree gather over Her lalitasana in lifelike folds. Starting from the crown and the kundalas to the rest of Her shringar, their luxuriance conveys Her divine presence. Zooming in on the back would enable you to appreciate the sheer amount of detail that the sculptor has put into this work - the five cascades of gorgeous hair gathering in one superb mane down the back, the petalled halo. What sets this Gayatri Devi sculpture apart from the usual Hindu devi iconographies is the majestic lotus arrangement that functions as Her pedestal. Two freshly bloomed lotuses have been placed with the bases of their pistils together, and the Devi Gayatri is seated amidst the flared petals of the one opening upwards.